I’ll have a main dish, beans or meat of some kind in one. And I’ll make some rice or quinoa in the other. I’ll set the other one up for a “second dinner” with some Steel Cut Oatmeal. This is common practice around my kitchen, especially on “sports practice nights.” I run the 2nd IP while we are gone, so that a late night snack is ready when we get home from practices. Because doing this is WAY cheaper than everyone having a bowl (or three!) of cereal for a late night snack. For this meal, I have sticky rice in one and beef and broccoli in the other. Brown the beef cubes or strips. Mix up and add the sauce. Cook on High for 12 minutes. Once cooked, add cornstarch to thicken if you’d like. Then mix the broccoli into the sauce with the meat. Leave on warm and let it cook/steam for a few minutes. 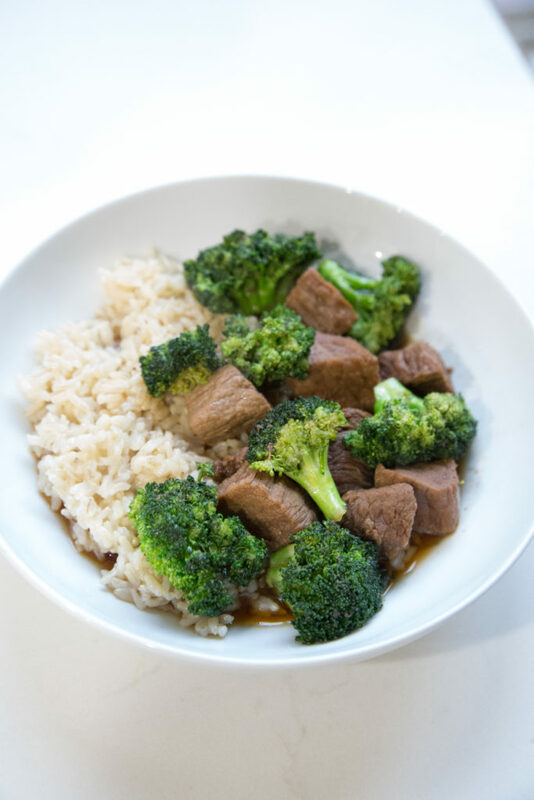 Mix up the sauce in a small bowl by whisking together the beef broth, oyster sauce, so y sauce, sesame oil, ground ginger, and brown sugar. Add the canola oil to the insert and press Saute. 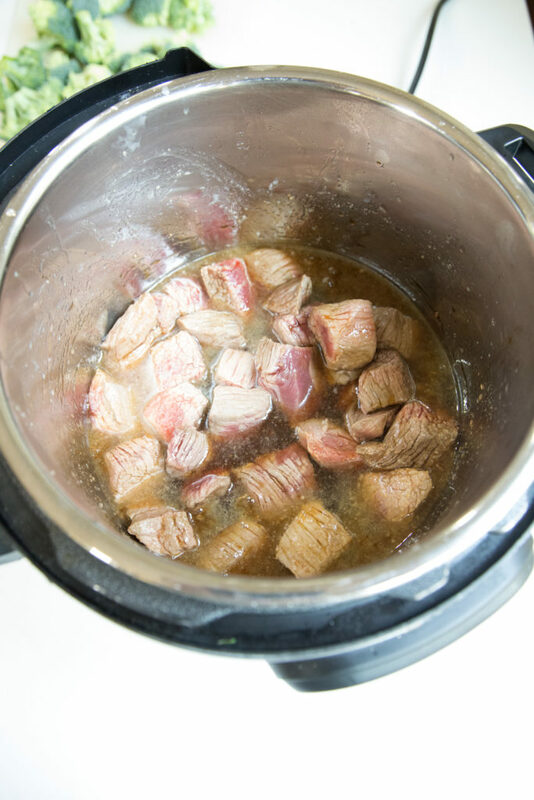 Let it warm up for a few minutes, then add the beef cubes or strips and brown on all sides. Pour in the prepared sauce. Tap Cancel, then put the lid on and set to Sealing. Cook on High for 5 to 7 minutes, depending on how thick the beef is. 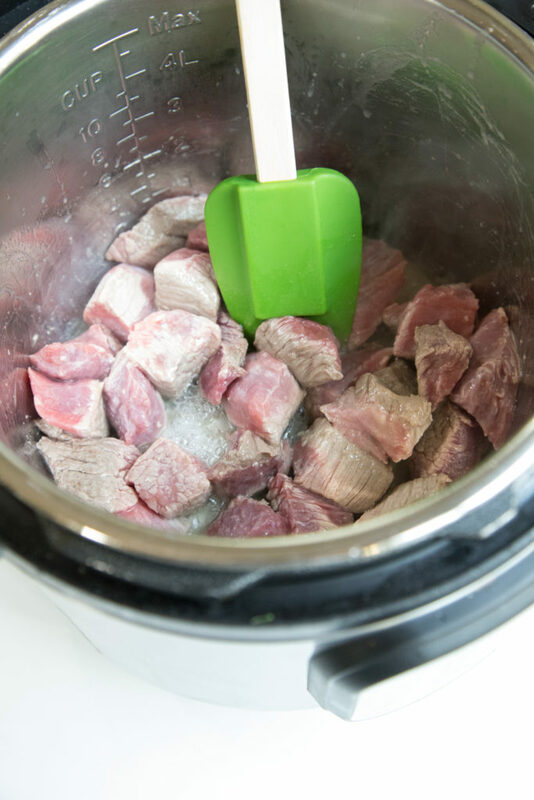 Thin strips for 5 minutes, cubed beef for 7 minutes. Quick release the pressure. 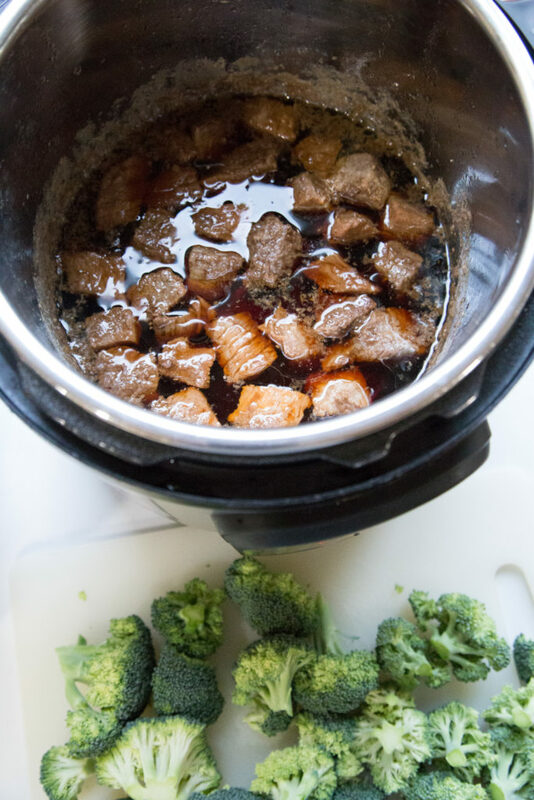 Then stir in the broccoli into the beef and sauce. 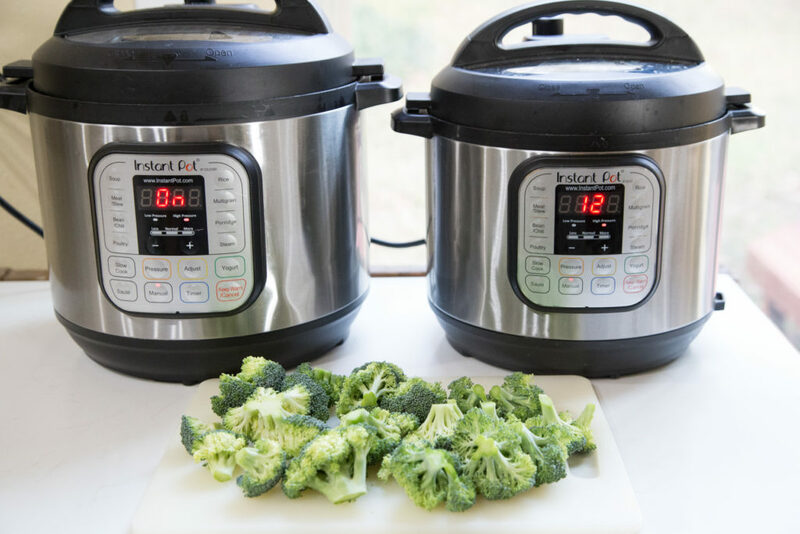 Let it sit on “Keep Warm” mode (with the lid off) for 5 minutes to let broccoli steam up. If desired, stir in a cornstarch slurry BEFORE adding the broccoli to thicken the sauce. 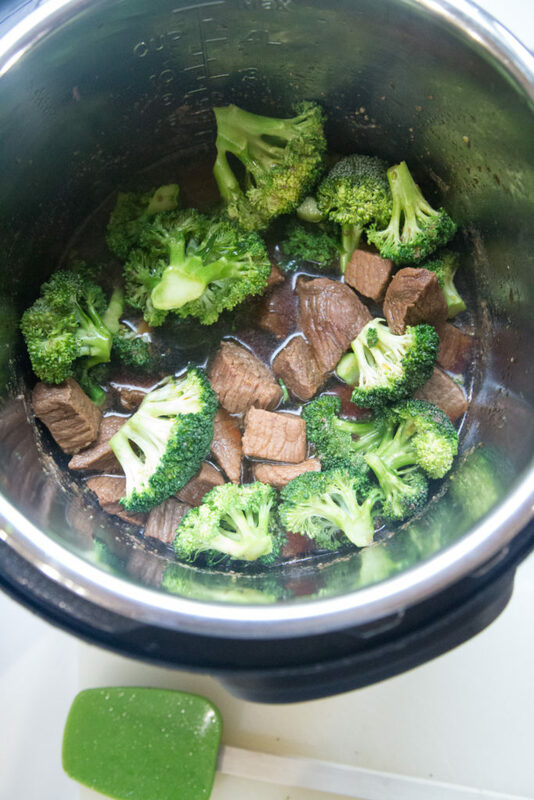 The sauce will thicken as it sits on warm mode, as the broccoli is steaming. 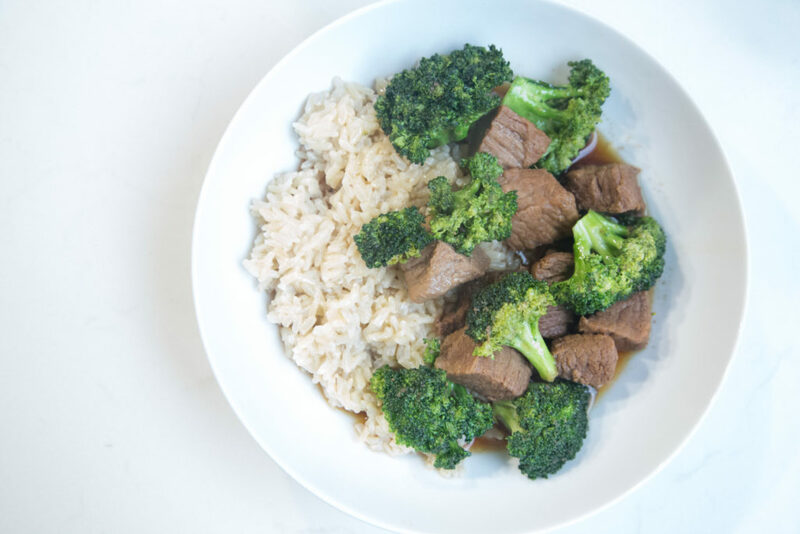 IMPORTANT: I do NOT recommend cooking the broccoli with the beef and sauce…it will result in very mushy broccoli. It’s better served in the meal, freshly steamed with a little crunch! 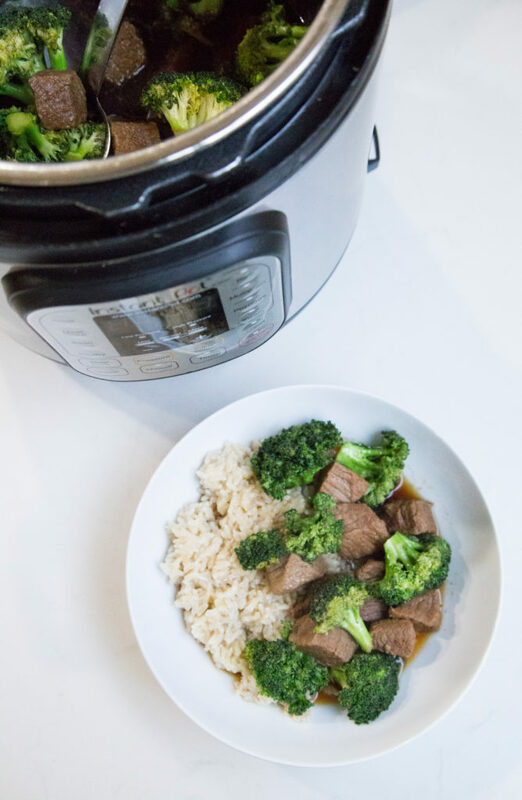 Serve Instant Pot Beef & Broccoli with sticky rice and some eggrolls!